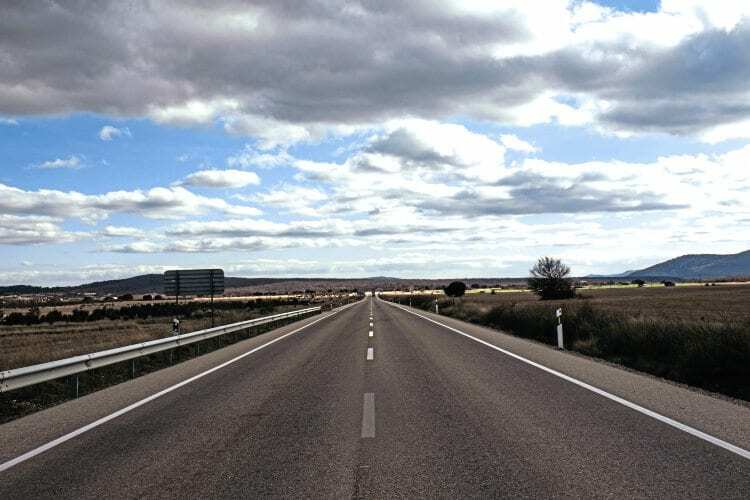 Long haul through Spain proved more of a trek than expected. The look on our instructor’s face said it all. 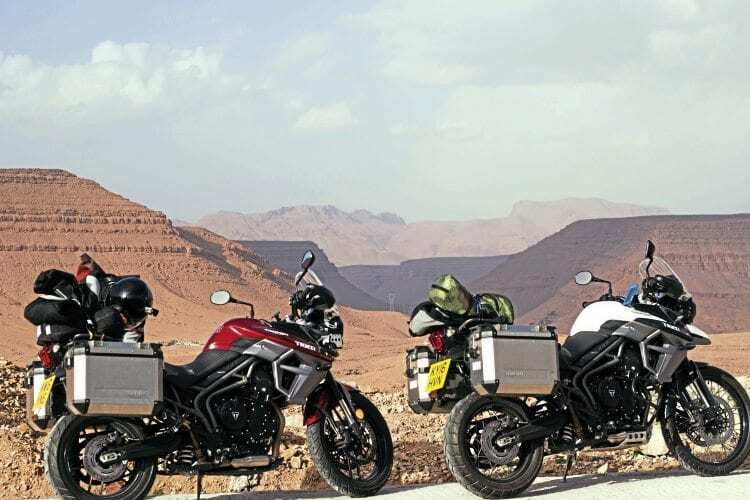 We’d turned up at Welwyn Garden City motorcycle centre for our first lesson, and announced that we were intending to leave for Morocco in just nine days’ time. He clearly thought we were arrogant and stupid. In freezing January rain, with waterproof trousers and high-viz waistcoats, this certainly wasn’t how we expected our adventure to begin. 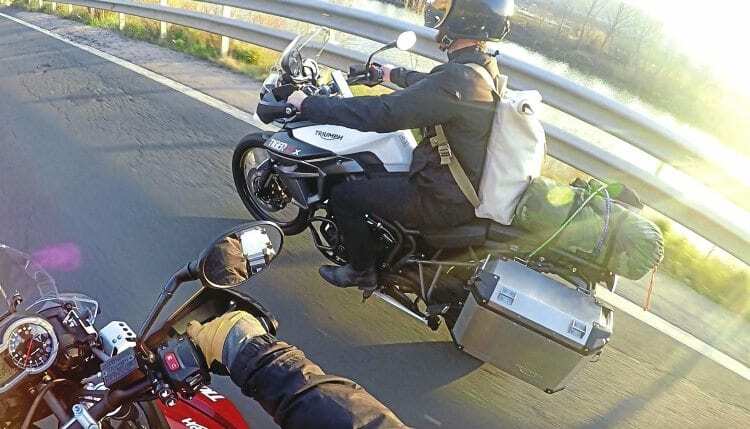 Panniers, tailpacks and small backpacks made up the luggage. 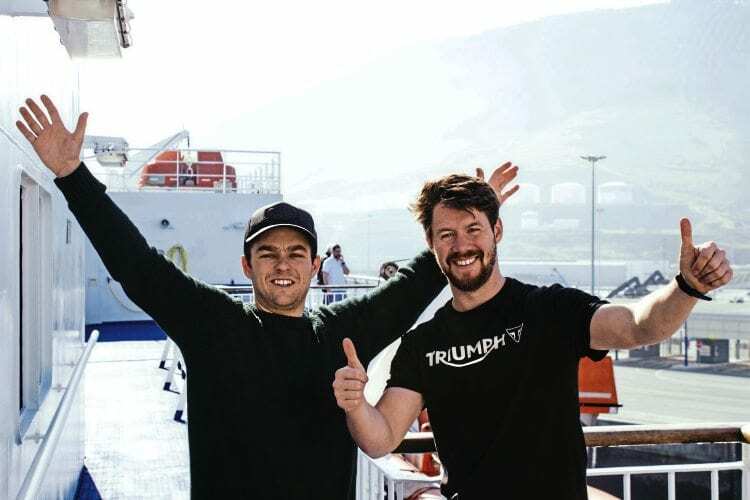 But by some miracle, we both passed our tests within the nine-day window, which was just as well, as Triumph had already agreed to lend us a pair of Tiger 800s. 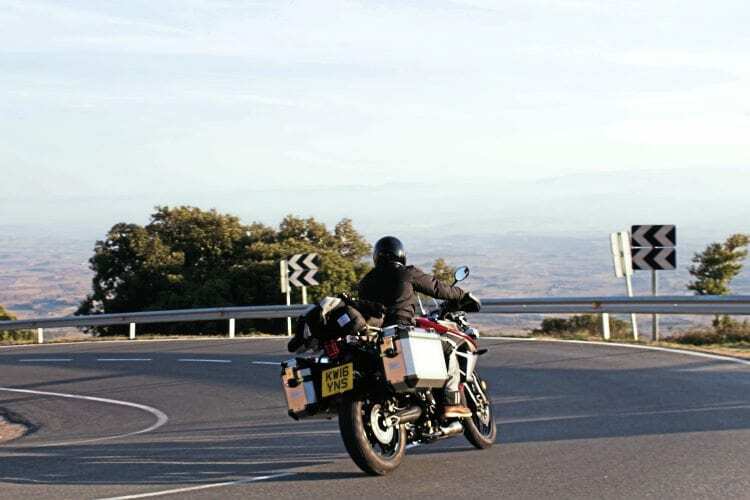 With a rough route through Spain and Morocco planned, and a few clothes, cameras and documents, we gingerly headed out of London and rode to Portsmouth and the Bilbao ferry. After a two-hour ride out of Bilbao we climbed the Cantabria mountain range, and sat up on the roof of Rioja for a stunning panoramic of the entire region. Vineyards and bodegas spanned beyond the horizon before we were treated to a 20-minute hairpin descent down into the valley. We spent that evening in Logrono, the main city of Rioja, and were put in contact with a local who was going to show us around and take us on a tour de tapas. The culinary culture here is not about sit-down meals, but meandering your way through the countless tapas bars lining the streets, spending 10 minutes in one, five in another, until you’re suitably full. Our host’s family owned the oldest tapas bar in town, which served nothing but garlic mushrooms and prawns on bread. This theme ran throughout the area, the bars choosing to do one thing incredibly well, rather than lots of things to a mediocre standard. This is what they came for. With a slight Riojan haze filling our heads the following morning, our next destination was the small town of Neuvalos, and what we expected to be a simple three-hour stint. We were wrong. It was the first time in our short riding career that we had experienced strong winds, and as we passed into the flat plains of central Spain, these grew in strength and ferocity. Soon we were being blown right across the road into the opposing lane, and found ourselves leaning at an extreme angle to counteract the blast. Every now and again, the gusts would suddenly drop and we would wobble violently to correct our leaning postures – like someone pulling a chair from beneath you. How do you follow up rowing across the Atlantic? 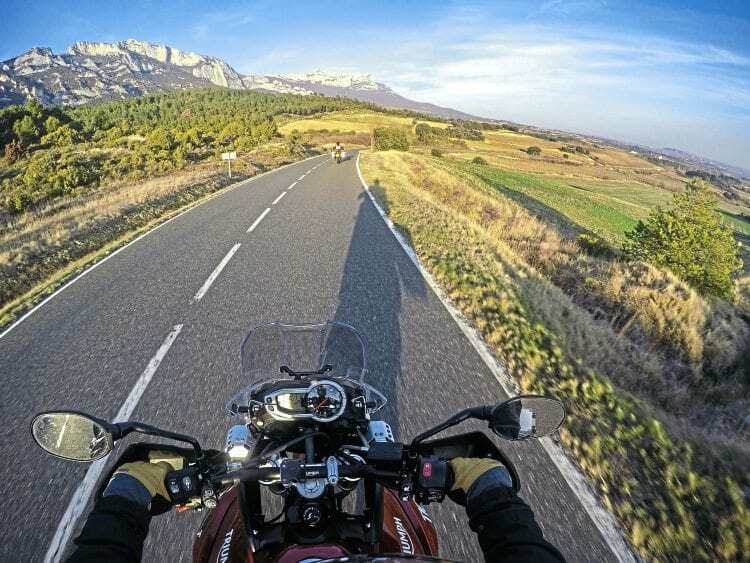 Ride across Europe. We opted to take to slower, smaller roads, which turned out to be one of the best decisions of the whole trip, winding through some of the most stunning scenery we’ve ever seen. We didn’t see another human for the rest of the day, passing through ancient-looking towns, derelict and weather worn. As the sun set around us, the landscape was brushed with a pink and orange filter, and we sped on our way, grinning. It was moments like this that we had hoped for when planning the trip. The boys’ cornering skills were honed with the miles. We had planned to make our way down the coast to Gibraltar, where we would enter Morocco via the short ferry ride. However, it soon became apparent that we had wildly underestimated the daily distances we’d have to ride. 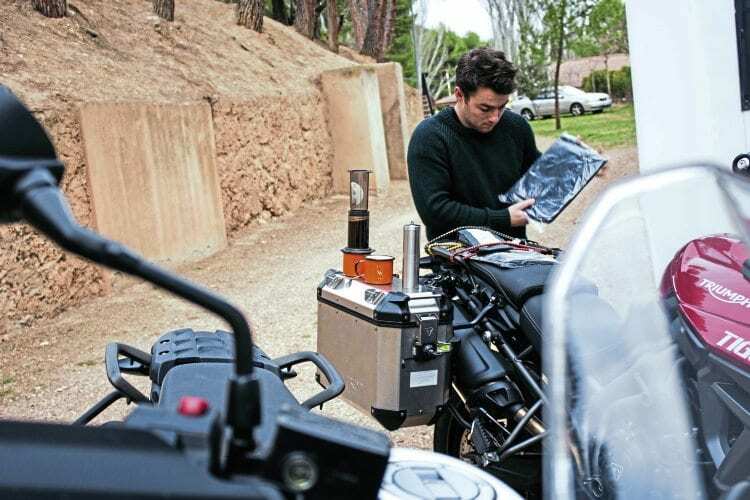 When planning, our calculations were made based on experience driving a car long distance, but we soon learned that four hours on a bike and four hours in a car are two very different things. When riding a bike, you’re concentrating every second of every minute, constantly engaged and alert. In a car, it’s far easier to zone-out and go into autopilot, thus making time move fast and trips more manageable. On the boat to Morocco and still raring to go. 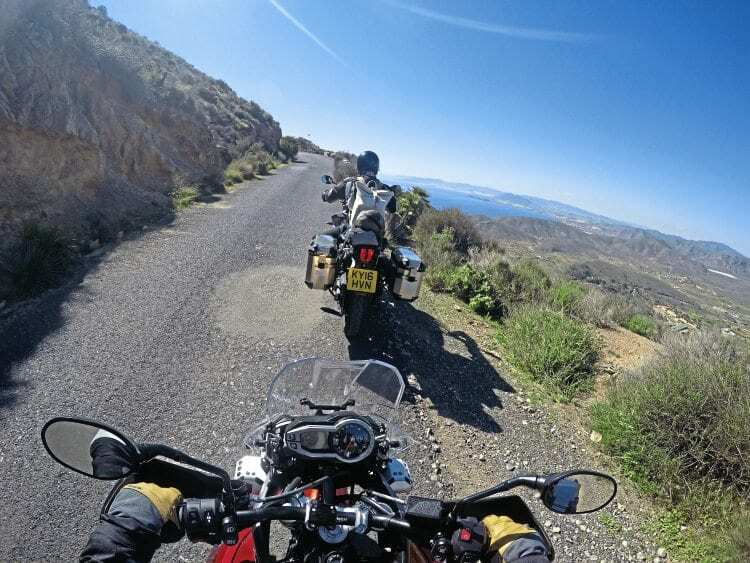 Essentially, we realised that riding to Gibraltar would require some serious stints on the motorcycles, with no time to actually explore and enjoy different places; something we were 100% committed to doing. We scrambled for alternatives, and found we could in fact jump on a ferry in Almeria, and enter Morocco via Nador, an entry point completely devoid of tourism and western culture. Our border crossing into Morocco was nothing short of chaos. We were the only westerners there, and were hounded by people trying to fill out our forms and help us across. We were initially dubious, and put them alI off, claiming we had it all sorted. However, it soon became apparent that we couldn’t do this by ourselves – English wasn’t on the menu, and our broken Spanish was not cutting it with the officials. 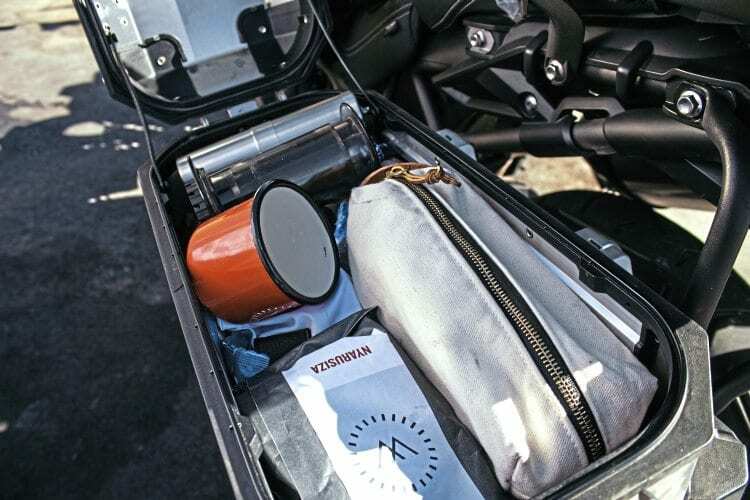 Bleary morning essentials, with coffee on the go. After 20 minutes or so, we gave up and acquired the services of the most persistent of our aspirant helpers. It was a good move, as he efficiently guided us through the whole process, getting us through customs and filled out our forms (spelling almost every name and place of birth incorrectly, but no one seemed to care). We paid him his dues, and his day was made. We had misjudged the intentions of those trying to help us, presuming we would be ripped off. This was not the case, and our ill-informed preconception had done nothing but hold us up. 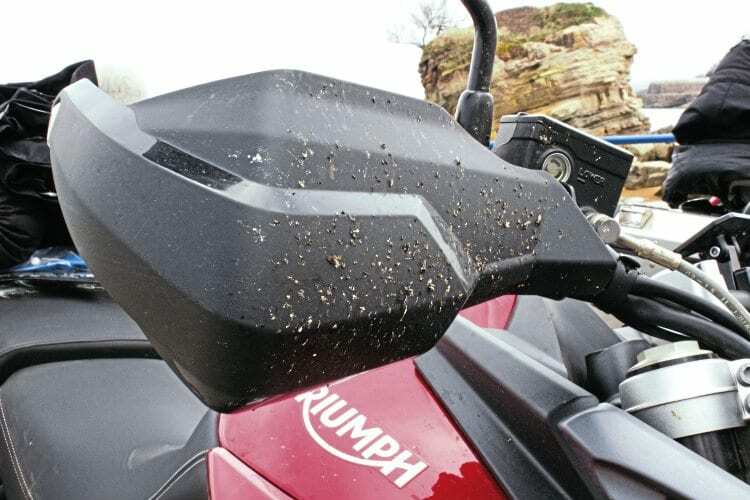 A thousand flies died for the cause. After the three hours it took to gain entry to Morocco, we set off through Nador and into the countryside. 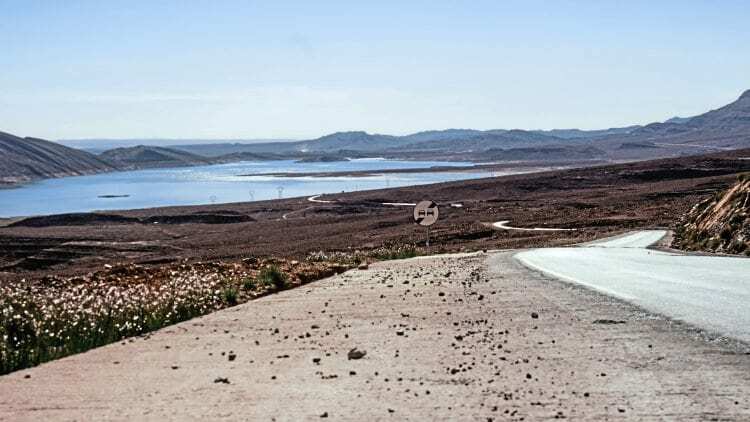 From the pristine Spanish coastal cities we had seen just hours before, we now found ourselves weaving between the carnage of Moroccan traffic. Horns blowing, shouts, dust and goats filled every street, and we were part of this melee. But we soon realised that the seemingly lawless roads were in fact more organised than they first appeared, and we learned quickly that a horn is used to signal that the driver intends to do something. In fact, – pretty much anything! We embraced our surroundings and got stuck in, weaving and beeping with the best of them. Tigers were road-based XrT (left) and more off-roady XrX (right). Our new route would take us from Nador, down a single road through Midelt and into Merzouga, right on the edge of the Sahara. So we had some long hours on the bikes ahead, but the intensity and sheer beauty of Morocco was overwhelming. We were growing in confidence on the Tigers too, and starting to push them harder. 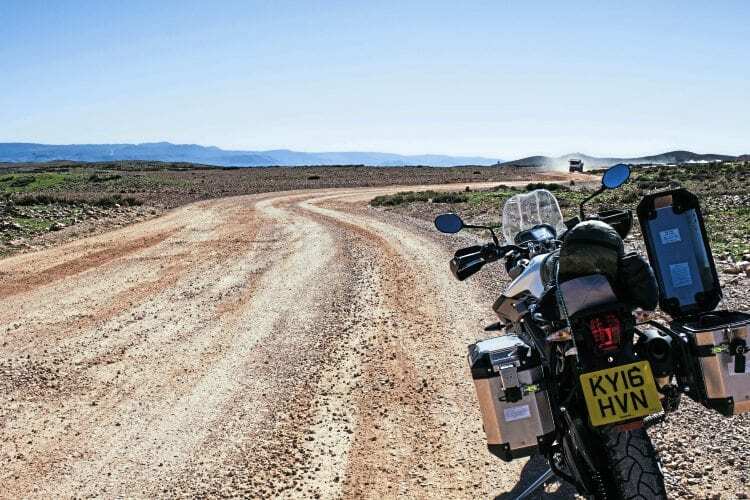 The long, empty roads through the barren desert were the perfect places to open up the throttle and have some fun, and the backdrop just underlined what a wonderful experience this was, as we passed through abandoned towns, towering canyons and lush green oases. A little easy loose surface – all part of the learning curve. One thing that struck us even more than the incredible landscapes was the reception from the local people. Every child, every elderly person, policeman and goat would smile and wave at us. All right, not the goats, but you get the idea. The outlook of these people, whose lives are filled with struggle and hardship, was infectiously positive. It was something we encountered wherever we went, but one person in particular made a real impact on us, leaving us speechless and humbled in equal measures. Moha owns a tiny cafe in the desert, and we had pulled in to grab some food and stock up on water, only to find we had no cash, and Moha couldn’t take cards. Resigned, we started packing up to leave, but Moha told us to sit down, and that he would gladly feed and water us free of charge. The willingness to give, when he had so little, was a trait that seemed to be engrained within most of the Moroccans we met. The further south, the more barren the terrain. The town of Merzouga was our ultimate destination, and it didn’t disappoint, living up to the Google images we’d seen countless times when researching the trip. Towering orange dunes, shining in the intense desert sun, stretched off to the horizon, as far as the eye could see. We had started as novice riders, and arrived not experts, but at least confident riders with a library of memories, and a newly realised passion for bikes. But this was as far south as the Tigers would go. We rode them along a sandy back road to a hotel, where we parked them up. The road tyres were no match for the steep sand dunes, and nor for that matter were our riding skills, although we had learnt a lot in a short space of time. The funny thing was that we soon found ourselves talking about the ride over beers, and looking forward to the journey back. After a couple of days’ relaxation, we were more than ready to go. With bodies rested, we turned the bikes north, set our Google Maps to London, and headed home. Heading home , with the Mediterranean back in sight. Our ultimate goal for this trip was not just reaching a destination, but to show that you don’t have to be an experienced rider to take on a trip like this. 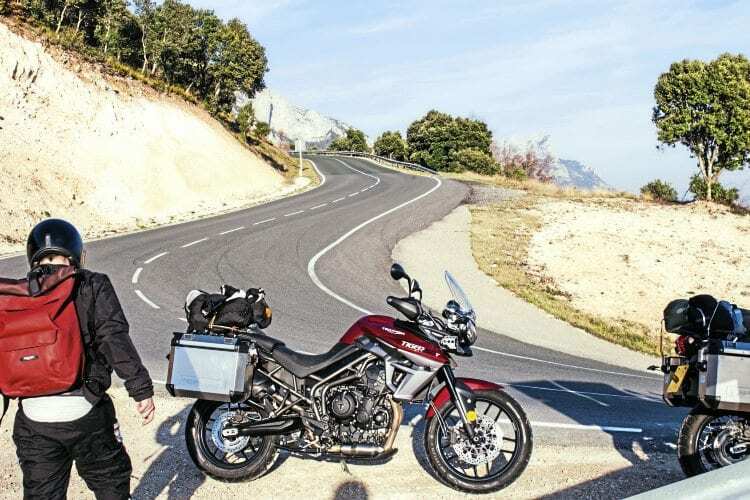 Many people are intimidated by long rides, unknown roads and dodgy border crossings, while adventure bikes are often labelled as best for the older rider. But none of this is the case. We are two young guys, with no experience or credentials to call upon, but have just returned from two of the most enjoyable weeks of our lives.